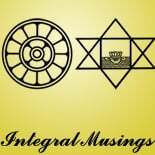 [Some interesting and significant stories and images from Indian mythology on Indian cosmology]. One day, Brahma, the creator, became a little proud that he was the creator of the Universe. Savouring, this ego-centric sensation, Brahma closed his eyes in meditation. He entered into an inner region where he was astonished to see another Brahma creating another universe. Brahma muttered “I thought I was the only creator of the universe but here is another Brahma creating his own universe”. As he moved deeper and further into the region, he saw in great wonder a multitude of Brahma’s creating numberless universes. A divine voice whispered in Brahma’s heart: “Oh, Brahma, don’t be proud you are the creator of the universe. In the Divine Mother’s cosmic play you and your universe are an insignificant nothing. There are billions of Brahmas creating billions of universes and all these multitude of worlds lie in a little corner in the divine Mother’s toe-nail”. These kinds of stories have a dissolving effect on our ego. If the creator of a universe is an insignificant nothing, what is the value of the works and creation of our own petty little ego’s —- however “big”, “important” or “creative “ it may ——except as a means to grow towards the divine within us, which is the only true value of our work. As Sri Aurobindo states in an inspired passage. “The ascent to the divine Life is the human journey, the Work of works, the acceptable Sacrifice. This alone is man’s real business in the world and the justification of his existence, without which he would be only an insect crawling among other ephemeral insects on a speck of surface mud and water which has managed to form itself amid the appalling immensities of the physical universe”. We are here talking about the higher aims of work. This doesn’t mean work as such has no significance. Any work done with sincerity, dedication, discipline and concentration, even if it is without the divine or yogic dimension helps in the development of our faculties of action, building character, contributing to the common goals and in the general evolution of our consciousness. Coming back to Indian Cosmology, a beautiful image in Indian mythology pictures an infinite ocean where numberless Brahmandas, universes, float. In one of them which is made of seven planes, lokas, which is ours, a beautiful divine child lies asleep. What is the Idea behind this image? There is that timeless Absolute with infinite divine truths, possibilities or potentialities. A few of them are projected into space and time and made the basis or principles of a cosmos. The cosmic system of which we are part is made of seven principles: Matter, Life, Mind, Supermind, Sat (Being), Chit (Consciousness) and Ananda (Delight), each forming a cosmic plane, loka, with its own worlds and beings. There may be other cosmic systems made of entirely different principles, the nature of which even the greatest god or the avathar belonging to our cosmic system, cannot even conceive. Does it appear like some fantastic imagination or fantasy? But, as Sri Aurobindo and Mother have said, we can’t imagine something which does not exist somewhere. The very fact we are able to imagine these things indicate they exist somewhere in space and time or in that timeless unthinkable Mystery. In Indian Philosophy “Sat” is the ultimate divine Principle which gives existence to all that exists. It is that by which all things exist. It is normally translated as “Being”, “Truth” or “Existence”. In one of his writings Sri Aurobindo gives a more exact and precise translation of it as BE ness.The Christian mystic,Meister Echart, describes God as the IS ness of all that is. In human being it is the sense of “AM”ness in the feeling “IAM”. So “Sat” is the BEness or ISness of all that is. Something which does not exist anywhere has no Sat. How can you imagine something which has no Sat? This entry was posted on May 24, 2018 by integralmusings in Tales of Light.